Around the time I completed Love Wins by Rob Bell, I also finished reading the Erik Larson book In the Garden of Beasts: Love, Terror, and an American Family in Hitler's Berlin. Larson writes historical non-fiction and previously did the excellent Devil in the White City, Thunderstruck and Isaac's Storm, all of which I posted on close to three years ago. I've wondered at times just how much of the detail in Larson's books is real and how much extrapolated, but I've decided as a reader that it's both entertaining and real enough, with what I've read at the very least passing the smell test around authenticity. In the Garden of Beasts looks at the rising power of Hitler in prewar Germany through lens of new U.S. Ambassador William Dodd and his mid-20's daughter, Martha Dodd. It's well researched and along providing a view of prewar Germany, chronicles how Hitler and his ascent could well have been kept in check had the U.S. and other countries taken a less isolationist (and interested in German repayment of debts) view and and censured Hitler's anti-Jewish actions. While reading Larson, I found myself thinking of The Plot Against America by Philip Roth. It was based on the fictional premise of Charles Lindbergh defeating Franklin Roosevelt for the Presidency in 1940 and the U.S. taking dual paths of isolationism from the war in Europe and discrimination against Jews here at home. Roth's work was fiction, but based on real possibility as there were groups in the U.S. who firmly wanted to let Germany do what they will (a "not our problem" approach) and also wanted to curtail opportunities for Jews. Going back to the Larson book, this early U.S. attitude of not making waves with Hitler and the German government helped clear the path for his consolidation of power and growth of the German war machine. Obviously, the U.S. later entered the war in Europe and Germany was defeated, but it perhaps Hitler could have been stopped earlier. All conjecture of course, but an interesting thing to think about and Larson does a good job in his book of writing about Ambassador Dodd and his daughter Martha as vehicles to detail Germany at the time and Hitler's taking of control. Recently finished reading Love Wins by Evangelical Pastor Rob Bell. Interesting book that I first heard about from the Time Magazine cover story “Is Hell Dead” (and then wrote about in this blog post). There’s no unequivocal answers that come out of Bell’s work, but it's thought provoking on the questions and subjects covered... with those below being the main things I felt Bell was addressing. Is it a God of inclusion or exclusion? Both in the beginning and later in the book, Bell questions the conversion to Christianity story as it’s commonly thought of. Specifically the notion that if people don’t repent their sins and accept Christ, it’s over for them… off to a lifetime in Hell after death. Basic question he raises is whether a benevolent God would exclude so many people just… because. The "love wins" notion is that God has a purpose and doesn't give up, to the point of granting virtually endless chances to live a Godly life, even after death as we know it. Basically, a story of inclusion for those that want it, not a story of exclusion by God based on a time space continuum. Where are this Heaven and Hell and is the point to just reach the first place? The idea is put forth by Bell of Heaven as a place on earth (no, not like the song) and entering into this state of living here and now for people who accept Christ. Rather than the acceptance being a free pass for after death, two phrases from Bell are "dragging the future into the present" and "living in this age and the age to come." In terms of Hell as a place, Bell notes that there’s no mention of it in the Old Testament and New Testament mentions could easily be interpreted as referring to a Hell on earth type of living by those who reject a righteous life. Additionally, Bell relates the story of two sons, one who strayed from his family and returned to an embrace in spite of his wrongdoings and one who stated and was resentful of not being rewarded for his good behavior. The reason for inclusion of this story seems to be to illustrated the concept of God's love always being there waiting for people, and them having the choice to accept it at any point. Bell also uses the phrase "we shape our God and our God shapes us" in the telling of this father and two sons story. Moral living or Christian living? One could almost take what Bell wrote about view it through the lens of morality rather than Christianity. However, I believe it was C.S. Lewis who wrote about God as the basis of morality… with the concept being that if righteous living didn’t come from a higher power, where would it had come from at all? In short, actions by people show what God's love looks like. Bell just doesn't get into it other than reference to a series of endless chances to come to God. I don't know if that's a case for reincarnation (and none of us including Bell know for sure what comes), but I did find myself unclear about the author's beliefs on the subject other than his brief mention of multiple dimensions in relation to God. All in all, I thought it a interesting book that also made me want to learn more about what Bell says through his Mars Hill Bible Church... and read more C.S. Lewis (who Bell notes being impacted by) for that matter. Really compelling and well written cover story in the May 23 issue of Sports Illustrated. Written by Lars Anderson, Terror, Tragedy And Hope In Tuscaloosa is about the devastating tornado of April 27 and delves into the storm's impact on the University of Alabama and it's community... with 6 UA students among the 41 dead in town. The writing comes across as very personal and contributing to that is Anderson's mention of living in neighboring Birmingham. While this inclusion violates the widely held writing rule of not injecting oneself into a story, it seems appropriate here. It's profound stuff and does an excellent job of looking at the role of sports (particularly Alabama football) in a community. There's solid linkage of what sports means to people, but not to the point of overreaching in describing it's importance. Some solid content from the May 9 issue of Businessweek. The lead essay was "Why Bin Laden Lost" by Brendan Greeley and featured insightful writing about Bin Laden in the same vein as the commentary by David Von Drehle for Time which I posted on and linked to. Less profound, but also interesting from this issue was the feature piece "Taco Bell and the Golden Age of Drive-Thru" written by Karl Taro Greenfeld. This was one of those cases where I first took note of a piece based on the author... as I recall reading and posting on Greefeld's "Growing Old with Autism" book excerpt two years ago in Time Magazine). This first Greenfeld piece fit into the category of excellent and important writing and while I don't imagine he saw Taco Bell and Supply Chain efficiencies on the same level of import as autism in his family, the recent story it's an interesting one about the mechanics of a huge business segment. - Charlie Rose interview with Netflix CEO Reed Hastings. - "Otávio Good's Instant Translator" about the Word Lens iPhone app. Program does visual language translation via augmented reality, or layering of new data on top of an image from the phone's camera. Really interesting piece on the topic of collaborative consumption in the May issue of Fast Company Magazine. Written by Danielle Sacks, "The Sharing Economy" overviews the idea and business of people sharing stuff and provides a look at the current players and where the market might be headed. Sacks begins with the story of Neal Gorenflo, a former DHL staffer and then founder of the non-profit Shareable... which came out of Gorenflo working to remove from his life things that didn't add value. While it may seem a squishy step to go from life purpose to growth business area, there really is a lot of use to be had from and money to made out of resource sharing. To this point, one of the main things covered by Sacks and in this sidebar piece is how many different categories of goods and services can have the concept of collaborative consumption at play. Freecycle, Thredup, Zipcar, Airbnb, Neighborgoods... all players in this space sure to joined by many others. Several additional sources of information that Sacks cites are a Lisa Gansky Tedx talk on car sharing and the Rachel Botsman book What's Mine Is Yours: The Rise of Collaborative Consumption. Reference is also made to the idea from Botsman of access to goods and services being more important than ownership of them. Fascinating concept this sharing thing... and also referenced elsewhere in this this issue of Fast Company with Brave New Co-Working World about shared workspaces. While reading the just released In the Garden of Beasts from Erik Larson, it got me thinking about how long it takes to write good non-fiction... and when some of my favorite non-fiction authors might have new work. Erik Larson - writes historical fiction (least that's how I'll describe his work) with lots of detail and narrative around events in time. Published Thunderstruck Sept 2007 and then In the Garden of Beasts May 2011 - 3 1/2 years apart. Jeff Jarvis - writes on business topics and published What Would Google Do? Jan 2009. New book Public Parts scheduled for Sept 2011 release some 2 1/2 years later. Susan Casey - writes sports-related with a bent towards adventure prose. Penned The Devil's Teeth May 2006 (which I felt like put me in an elite club for having read) and then published 4 1/2 years later in May 2010 her bestselling The Wave. Michael Lewis - writes books that sell lots and lots of copies on a variety of topics... from High Finance to Parenthood to Major League Baseball. Last published The Big Short in Mar 2010 and has Boomerang: Travels in the New Third World scheduled for Oct 2011 release. While this does sound to be a follow up to The Big Short, it is interesting to see that release would be only a year and a half after it. J.R. Moehringer - someone I've come across more recently and just last year read his 2006 memoir The Tender Bar. Last book was the co-written with Andre Agassi biography Open, published Dec 2009. Bill Bryson - prolific travel writer who last did At Home in Oct 2010. Other authors who I look forward to seeing their next books (hyperlinks to past work) include S.L. Price, Chris Jones, Austin Murphy, John Grogan and David Von Drehle. The point of all this... there's great non-fiction work out there, but it can take a while to write a new book. As evidence of this, the excellent Laura Hillenbrand book Unbroken, released in Nov 2010 eight years after she published Seabiscuit. It's been a few months since I last posted something from Joe Posnanski, but it's certainly not for a lack of quality words published by him... either for Sports Illustrated or on his blog. Really, I'm perpetually amazed at the volume of work he publishes and frequently find writing that strike a cord. Two blog posts that stood out to me lately were Honesty and then Daughters and Roller Skating a few weeks later. Whereas one piece centered around a Vietnam Vet and the other Posnanski's 6 year old daughter, both pieces traffic in what can be generically called the Human Element. Being true to yourself and others, finding your way as a kid and parent... each thing important and written about very eloquently by Posnanski. May not be incredibly timely at this point, but two good Time Magazine pieces from David Von Drehle on the death of Bin Laden. The cover story was Killing bin Laden: How the U.S. Finally Got Its Man and from the Time website came After Bin Laden: A Stronger America. Von Drehle is an excellent writer and both pieces feature thorough and insightful prose on the conclusion to a long pursuit. Additional note to make, though, is how annoying it is that the cover story link doesn't actually go to the entire text of the Von Drehle story, but rather an abridged version that tells readers to go buy a hard copy issue or utilize the Time iPad app. Question on this topic would be what exactly the Time staffers making this decision to abridge think they'll accomplish? Perhaps said decision-makers wouldn't agree, but I think it more likely for someone to read an entire piece online and be interested in subscribing than they are to read an abridged piece on the web and then go somewhere to purchase a hard copy issue. As to the notion of driving people to the Time iPad app... ok, that works for the people who have an iPad, but as great as the device may be, it's not something everyone's got. I've written about it a few times here, but lots of great stuff on of the Chris Jones blog Son of a Bold Venture. Content ranges from the tactical with writers answering questions on their craft to profound with missives on aspiring writers (or really aspiring anyones) tilting at windmills as they try to realize career goals. The last two posts at Son of a Bold Venture trafficked more towards windmill tilting with "Lydia Could" about pursuing a Journalism degree in spite of the profession's career arc (much less arcy these days) and then "The Chattanooga Fix" about the small chance of success in writing a book measured against required time and effort. Rather than leaning towards the doom and gloom, though, me thinks these posts both inspire based on what I take as the directive that... you try, you may or may not succeed, but you try. If you know what you want, great... you try to do that. If you don't know, but have an idea... you try around your idea and see where that takes you. If you have no idea, you scattershot about at different things... and hopefully find something of import to you. Either way... yep, you try. If these two most recent Son of a Bold Venture posts were about... duh, trying, there were a few prior to that on a different topic I feel strongly about, words. "A Parting Glass" featured a Charles P. Pierce written eulogy on fellow writer Clif Garboden. It was simply very cool reading about how someone loved what they did, and that thing being the writing of words on a page. One other Jones missive from the past month that struck me around this topic, but it really wasn't his writing in the post that hit me, but who he wrote about... and then a reader posted blog comment. "Opening Acts" begins with a reprinting of a J.R. Moehringer magazine piece, which I found of note as Moehringer's memoir The Tender Bar seems a close relative (if not ancestor) of what Son of a Bold Venture is all about. Both on writers, writing, words... all things I feel of import. In relation to this specific post, though, what I keep thinking about is actually a comment from another reader of it. I have let the busy-ness of life crowd out the time and love I once had for reading. As a bureaucrat my own writing is dry and dull (but sometimes artful in its own way). Your posts are drawing me back. I must go out and buy something other than a newspaper to read right away. I need to find time again to slowly savor and enjoy someone else' art of telling a story. I love it. While I enjoy the blog from Jones in part because it's about writers and writing as an act, it was great to see someone make mention of writing and words as a something to consume. Whether I'm writing them or simply reading them from someone else... I love words organized on page in a meaningful way (note the heading of this blog) and it's cool to read other people say much the same thing. 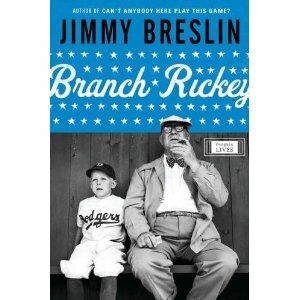 Just finished reading Jimmy Breslin's short book Branch Rickey on the man who brought Jackie Robinson to Major League Baseball. I heard about the biography from the Sports Illustrated piece "The Great Integrator" and generally agree with the SI assessment of it being a solid read. Rickey is a well-known author and newspaper columnist and the book definitely features quite a bit of the lyrical phrasing that Rickey is apparently known for. At times, it got to be a bit much for me with language used actually muddling up the story or point being made, but I do give credit to an author making an effort with his or her choice of words. All in all, I found it to be a pretty good book that shouldn't take more than a few hours from start to finish. Interesting piece of writing from the May 2011 issue of Esquire Magazine. Written by John Hyduk, "The Loading Dock Manifesto" is an account of the author's job for a beverage distributor along with past work experiences. It's solid writing that relates what's it's like to have something far removed from a white collar career and life. With myself as a reader having said white collar circumstances, it's interested reading about someone in a completely different orbit (which is of course is what can happen through reading). In addition to the story, I also found myself ruminating on the author himself. Here's a guy who can definitely write, is published in Esquire (with a byline note made of occasional publishing in Ohio and Cleveland magazines), but works on a loading dock. I'm interested in this idea of a guy with writing talent who doesn't actually write as his full time job. Does he want to write for a living, but can't catch a break? Is his stuff simply not good enough (though, this piece certainly is solid)? Is he not able to write as compelling prose if not about his life? Or, is he simply satisfied with his life and work (including both the loading dock and writing) and doesn't want to change? I certainly can't say, but (without knowing there is any sad tale there) you gotta allow for the possibility that this is someone with a job that meets his needs and a writing interest that he's able to do well on the side... and he's good with that. If that's the case, then kudos to Hyduk for carving out something that works for him. All conjecture here of course, but me thinks interesting things to ruminate on, and an interesting essay to read. Two additional pieces of writing from this issue of Esquire that while they didn't strike me as much as that from Hyduk, I found of note. Financial writer Ken Kurson did "Let Them Eat iPads" on his prediction of coming inflation... and ways to have the possibility guide one's investing. Definitely seems like there's something to his premise as higher prices on a variety of goods and services appears to be more and more widespread. "Walking the Border" is a feature from Luke Dittrich that chronicles the first part of his solo journey from the Pacific Ocean to the Gulf of Mexico. The writing wasn't bad by any means, but what stood out to me was this idea of taking on a challenge. The endeavour of course doesn't have to be walking the US-Mexico border, but that's something to be said for taking on a task whose outcome isn't certain.